Dr. Kuo is one of seven general pediatricians at Peachtree Park Pediatrics, one of the oldest pediatric practices in Atlanta. Treating children from birth to age 21, they describe their patients as “family” — fitting since some are in the second and third generations to receive treatment at Peachtree Park. The ABP Board of Directors tries to balance its composition with general pediatricians and subspecialists, private practitioners and academic physicians. After serving on the Pilot Testing Committee, Dr. Kuo joined the General Pediatrics Examination Committee that writes questions about behavior and development, preventive pediatrics, and adolescent medicine. As a member of the MOCA-Peds Task Force since 2016, she helped develop the pilot and wrote many of the questions used in the MOCA-Peds pilots in 2017 and 2018. Dr. Kuo joined the ABP Board of Directors and the ABP Foundation Board of Directors in 2014 for a six-year term. She will chair the board in 2019, and then serve another year as Immediate Past Chair. In her role on the Board, she also serves on the Finance, Long-Term Investment, Nominating, and Executive committees. 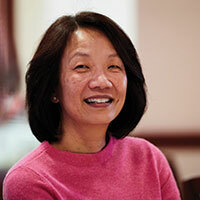 Dr. Kuo says her work with the ABP can be time-consuming, but the rewards are worth the effort.